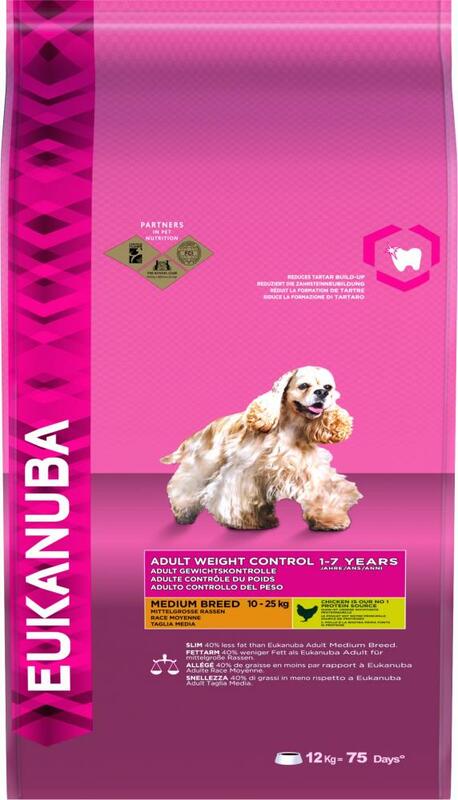 Eukanuba Adult Weight Control Medium Breed is for dogs 10 - 25kg that have a tendency to gain weight. It contains 40% less fat than the Eukanuba Medium Breed diet, as well as high quality ingredients such as animal based protein, fat, carbohydrates, fibres and important vitamins and minerals for the health and wellbeing of your adult dog. Recommended For: Overweight adult medium breed ( 10 - 25kg and 1-7 years). Maize, Dried Chicken And Turkey (16%), Wheat, Sorghum, Barley, Dried Beet Pulp (3.4%), Animal Fat, Hydrolysed Animal Proteins, Dried Whole Egg, Potassium Chloride, Calcium Carbonate, Dicalcium Phosphate, Sodium Chloride, Sodium Hexametaphosphate, Fish Oil, Linseed, Fructooligosaccharides (0.28%). Vitamin A (45287 IU/Kg), Vitamin D3 (1503 IU/Kg), Vitamin E (252 Mg/Kg), L-Carnitine (47.5 Mg/Kg), β-Carotene (4.9 Mg/Kg). Contain Basic Cobaltous Carbonate Monohydrate (0.61 Mg/Kg), Cupric Sulphate Pentahydrate (58 Mg/Kg), Potassium Iodide (4.2 Mg/Kg), Ferrous Sulphate Monohydrate (775 Mg/Kg), Manganous Sulphate Monohydrate (59 Mg/Kg), Manganous Oxide (42 Mg/Kg), Zinc Oxide (269 Mg/Kg). There are currently no questions for Eukanuba Adult Medium Breed Weight Control Dog Food - be the first to ask one!